Bedas are largely found in some villages of Leh (more specifically, in villages like Chuchot Yokam, Fiang, Nubra Valley and few others) and parts of Himachal Pradesh. They are considered to be partly sedentary and partly nomadic. They are the professional musician of the Bodh group in Lahaul and Spiti district. Their main musical instrument are flutes and drums. Traditionally they used to perform at different cultural occasions like crop sowing, child birth and marriage but in recent times because of little renumeration and need for money, they have also begun working as taxi drivers, tourist guides and other related profession, when not performing. Across the literature Bedas are considered a distinct tribe by the anthropologists. 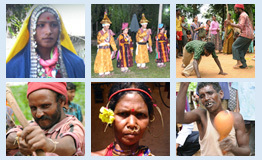 In fact, they were also given the status of Scheduled Tribe in 1989. However, despite this the number of Bedas has decreased over the last few decades. According to Census 1931, the number of Bedas was 414. It has slowly come to 128 according to Census 2001. Like other communities of the locality, Bedas are also expected to be endogamous. Marriage outside the community is generally not recognised but it is generally accepted under certain conditions. Generally bride-price is paid by the male members (which is returnable in case of divorce) since women are considered the economic asset. Furthermore marriages could be of two kinds – magpa, where boys come to live with bride's family (generally followed if the bride does not have a brother) and bagma, where girls come to live with groom's family. Bedas is not a monolingual community with just one mother tongue. Since they are spread over a large area ranging from Lahaul-Spiti to Laddakh, their reported language vary according to the area in which they reside. Bedas in Laddakh speak a language belonging to the Bhotia group. Also they use Bodhi as well Perso-Arabic script for writing. In the areas around Leh, most of the Bedas have shifted to Bodhi and only a few members retain their language. The preliminary investigation of the language indicates that it belongs to Tibeto-Burman language family. For the lack of any prior linguistic description of the language, it could be ascertained only after a detailed analysis. We are presently working towards the development of a Beda-Hindi-English tri-lingual dictionary as well as producing the first-ever linguistic description of the language.